HELLO!!! 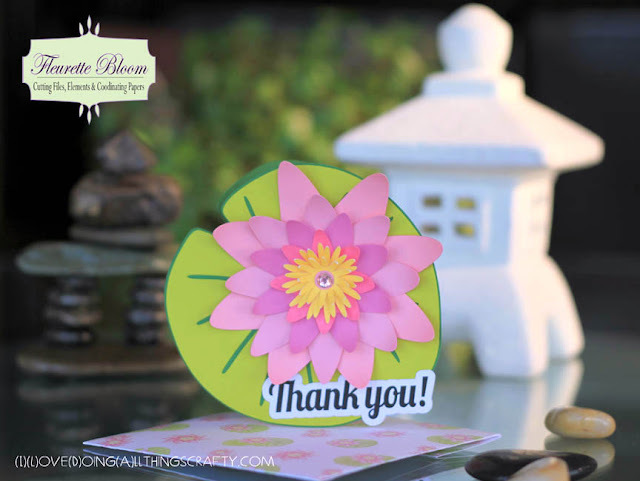 I am so excited to share with you my first Fleurette Bloom Design Team project today! Here is a very quick card I made using some elements from Fleurette Bloom's latest Swan Lake Element Collection. The coolest part was making the coordinating envelope with the Swan Lake Digital Paper Collection. Love how turned out, so elegant... if a card can be that, lol! I have owned my Silhouette Cameo for over a year now but had not really been using the machine to it's fullest potential! For some reason, I was always intimidated to use the fill pattern option of the program... well not anymore! All it took was one time and I am hooked! I will be using a lot more digital papers now!!! SO easy, can't believe it took me this long! Just look at how pretty the envelope is! I think it adds so much and, makes the card just that much more special! Don't forget to stop by Fluerette Bloom's Shop and check out all of her beautiful digital coordinating papers! Here it is again from a different angle. Isn't it SO pretty? Looks so much like the real thing! Take a look inside. I added a white inset layer... this adds a little extra strength and stability to the card... also makes it easier to see what is written when a darker colour is used. Here is a screen shot of how I turned the lily pad element into a shape card. If you are a visual person (like me) you'll appreciate this! It's true... a picture IS worth a thousand words! To make this simple, I placed all my steps in one screen shot. I'll start of with the top left image of the lily pad and work clock wise. 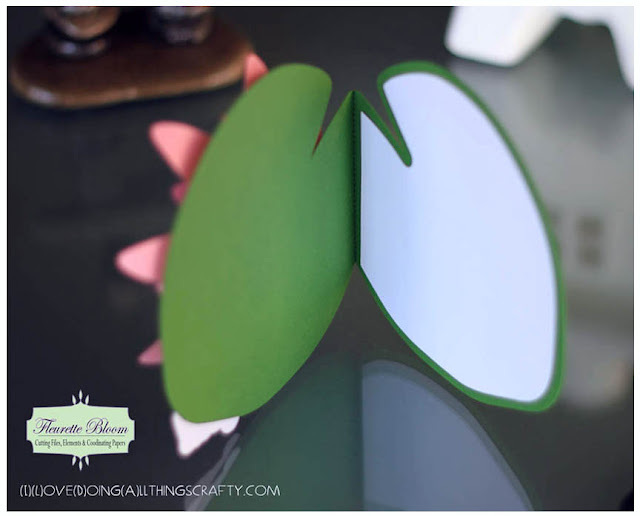 Import your lily pad base, this will then become the bottom part of the front of your card. To create the back of my card, first I copied and pasted the lily pad. Next I drew a straight line down the side of the card and then changed the style of the line to a dash. Group them together. Copy and paste image 2. Take your knife tool and cut the piece off just after the dash line you just created. Delete the piece with the dash line. To create the piece that lines the inside of the card, click on the image you created in step 3, and select the internal offset option. I set my offset at 0.1 inches. And that is how easy it is to create a shape card! Now all that is left to do is cut out all your pieces and assemble. You could stop after step 2, if you don't want to create the liner for the inside of your card. If you do, simply just cut the pieces out and place glue to the left of the dash line. Line up with the front piece of the card and press together! 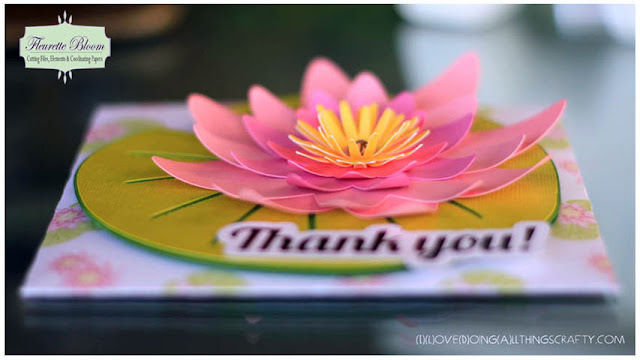 Don't forget you can also use the print and cut option to create the lily pad and flower if you decided not to make it 3 dimensional! 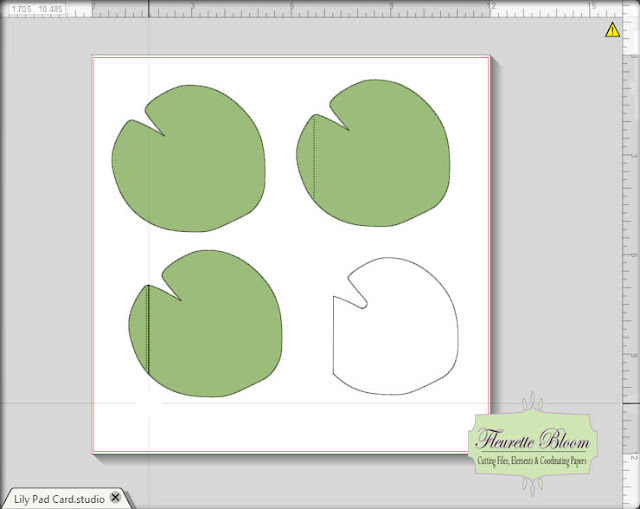 Hope you liked my Lily Pad shape card, and have learned how to make your own... at least the way I do. I'm sure there are so many other ways! Make sure you stop by Fleurette's Blog or Facebook page today because she has got some exciting news to share with her fans! Thanks for stopping by, leave me a comment... love to hear from you! Beautiful summer card Ilda! Don't you just love digital paper! You never have to worry about having enough paper to complete a project. Very cute card! I love shaped cards and this is very pretty! Thanks Michelle! I know now, I love digital paper... not sure why I didn't do it sooner! I thought it would waste too much paper, lol! This was an awesome tutorial. I haven't had my Cameo very long, and I don't have a lot of time to "play" with it. I use it, but mostly for two granddaughters that I do school projects, homework, and treats each month. I learned two things from your one post. The knife tool, and the internal offset. I want to thank you for taking the time to share this, put up pictures, (yes, a very visual learner) and for putting it in a way that was easy to understand. Took me a little longer to get through it. I had to go find the tools you were talking about, and opened my Silhouette so I could do the steps. This was just grand, just grand!!!!! P.S I don't want to be selfish, but I hope you do more. Oh and where did you get the file from. Fantastic, such a great shaped card.